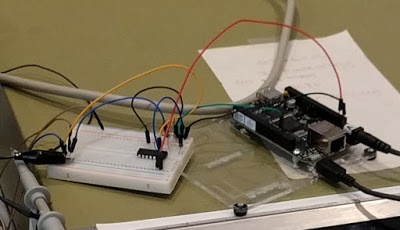 In this Alto restoration session we controlled the Alto's disk drive with an FPGA disk emulator and attempted booting the Alto with a BeagleBone-based Ethernet emulator. The GIF below shows the drive performing seeks as commanded by the emulator. (With the cover off the Diablo drive, you can see the disk head floating above the spinning disk surface and moving back and forth for seeks.) However, both emulators encountered some bugs, which we will need to fix. Looking inside the Diablo disk drive, you can see the head moving over the disk's surface as disk seeks take place. The green dial on the right rotates to indicate the current track. In our previous session, we discovered a faulty 7414 inverter chip on the disk interface card was preventing the disk from working: one of the six inverters on the chip had failed, preventing the disk sector task from running. Since we didn't have a 7414 lying around the house, we used a "dead bug" hack (below) to replace the bad inverter on the chip with an unused one, allowing us to access the disk. This session, we replaced the bad 7414 with a new one since we didn't want our hack to be permanent. Last week, I discovered that our boot disk had been overwritten with random data decades ago to test the drive (details). This made it impossible to boot off our disk, blocking our progress. 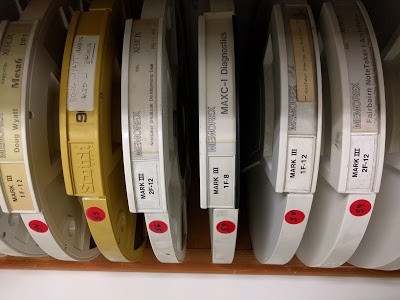 Tim Curley from Xerox PARC offered me some disks from PARC's collection of dozens of old Alto disks (below). Some people were concerned, though, that the disks could get damaged in a boot attempt, losing their historical data. To avoid damage, we decided not to boot these disks until we're sure the Alto is working properly and we have them archived. Instead, Josh Dersch at the Living Computer Museum in Seattle is sending us a fresh boot disk with no historical significance. Unfortunately we didn't get the disk in time for today's session, but we'll try it out next session. Some old Xerox Alto hard disks at PARC. I borrowed a couple of them and we'll try reading them later. Our test setup to exercise the Diablo disk drive (center) with the FPGA board (front). The oscilloscope shows the sector pulses (top, blue), clock (middle, green), and data (bottom, yellow). Four sectors are visible on the bottom trace. The Xerox Alto is behind the oscilloscope. On the right are the power supply and the laptop controlling the FPGA board. Carl built a Diablo disk emulator / exerciser from a FPGA board. The idea is we can hook this up to the Diablo drive to read and archive disks. Then we can connect the Emulator to the Alto and simulate multiple disk packs without physically handling disks. Building a disk emulator is complex because the drive itself implements very little functionality. It provides the raw bit stream as it is read off the disk, and the emulator needs to process this into bytes. In the photo above, the bottom oscilloscope trace shows several sectors as they are read from disk. If you're not familiar with a FPGA (field-programmable gate array), it is a chip that can be programmed to generate custom hardware. The FPGA chip contain numerous logic blocks along with a switch matrix that allows them to be interconnected as desired. You describe the hardware configuration (gates, latches, and so forth) using a hardware description language such as Verilog and the chip is programmed to implement the desired circuitry. The FPGA board for the emulator (below) is a Digilent Nexys 2 with a Xilinx Spartan-3E FPGA chip in the center of the board. This chip contains over ten thousand logic cells, allowing it to implement complex circuits. The FPGA board is connected to a prototyping board (right) with chips that shift the voltage levels to TTL as required by the Diablo drive. Carl's FPGA code generates the numerous signals required by the Diablo drive; in the photo below you can see the thick black cable going to the drive. A Digilent FPGA board configured to control a Diablo disk drive. We hooked up the FPGA board to the Diablo drive and tested it out. It communicated with the drive just fine and could read from different tracks. Unfortunately, the read data was zeros, which was surprising since the Alto successfully read from the disk last week. After some investigation, Carl found the problem was in the FPGA code that stored the data in RAM, not his code. (See his blog for details.) You'd think writing to RAM would be the easy part, but apparently not. The disk logic appears to work fine so hopefully next session we will be able to read and archive disks. The Xerox Alto was the first system with Ethernet, introducing a lot of networking innovations. Unfortunately, it uses 3 Mb/second Ethernet over coaxial cable, which is incompatible with anything modern. I built an Ethernet emulator using a BeagleBone Black, allowing me to send Ethernet boot packets to the Alto. The photo below shows the BeagleBone, along with a chip (74AHCT125) to convert the BeagleBone's 3.3V signals to 5V TTL signals. (The Ethernet signals to and from the Alto are 5V TTL. These signals normally go to a transceiver, which converts these signals to signals over the network cable.) 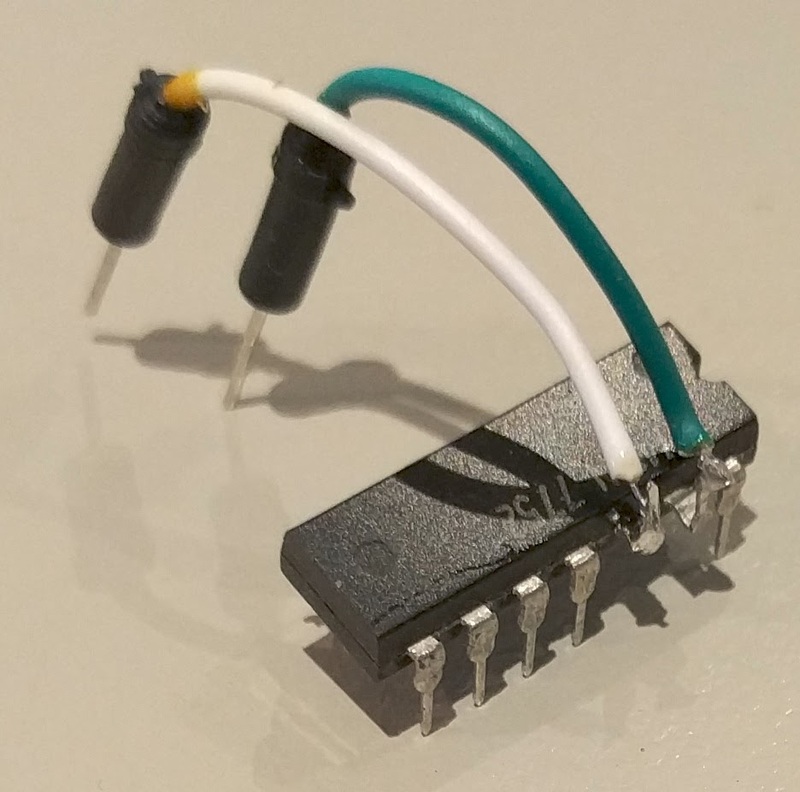 I'm using the BeagleBone's PRU microcontrollers to implement this code; I wrote a blog post with more about the PRUs. A BeagleBone Black configured to emulate the 3Mb/s Ethernet on the Xerox Alto. The emulator operates by converting a data block into the low-level signal required by Ethernet. A 0 bit is high-then-low and a 1 bit is low-then-high, with 170 nanosecond pulses. (Note that each data bit includes a transition (high-to-low or vice versa), which allows the receiver to detect bits and extract a clock signal.) My emulator almost worked; by using the logic analyzer, I saw the Ethernet microcode was running and the Alto was receiving data from my board. Unfortunately, there was about one bit error per word, making it unusable. The problem is probably interference due to the sketchy wiring I used; I'll try shielded wire next session. This week we tried a Diablo disk emulator and an Ethernet emulator. They both partially worked, but still have some bugs. Next week we'll try booting the system with a new disk. I'm moderately optimistic that the system will come up successfully, but there could be more hardware problems waiting for us. For updates on the restoration, follow kenshirriff on Twitter. Thanks to Josh Dersch and the Living Computer Museum for their debugging help and sending out a boot disk. Thanks to Tim Curley and Xerox PARC for supplying additional disks. The discussion of this post on Hacker News is here.